After the huge success of the Paddington movies, Peter Rabbit has a lot to live up to. The two Paddington films brought Michael Bond's loveable bear into the modern day without losing the integrity of the character. Adapted from the Beatrix Potter books, Peter Rabbit is less convincing: the contemporary music on the soundtrack and an irrepressible James Corden voicing the mischievous Peter feel rather incongruous. Directed by American comedy specialist Will Gluck (Easy A, Annie), there are moments of beauty, notably when Peter is recounting a story from his childhood. The sequence is illustrated with hand-drawn animation that resembles the original Potter drawings; older viewers are likely to yearn for more of these nostalgic offerings. Mostly though, Gluck aims for slapstick, with a story that sees Peter and his sisters Flopsy (Margot Robbie), Mopsy (Elizabeth Debicki) and Cotton-Tail (Daisy Ridley) contend with Thomas McGregor (Domhnall Gleeson), a former Harrods employee and the highly strung new owner of the cottage garden they like to pilfer vegetables from. No question, the interweaving of CGI animals and live-action is flawlessly executed by Australian VFX company Animal Logic. The physical comedy is well tailored to kids (not least with numerous adults falling foul of an electrified door). Gleeson, who hasn't had much chance to stretch his comedic muscles thus far in his career, proves more than capable, as he grapples with the 'vermin' in his garden. 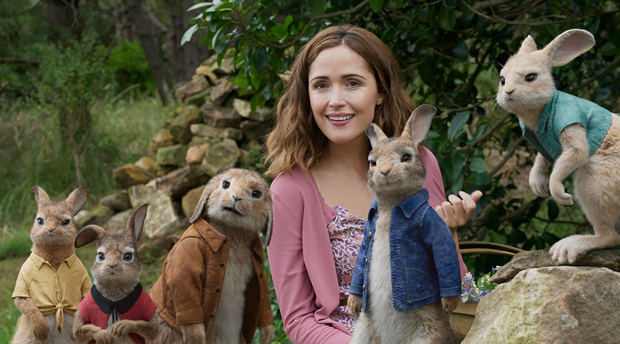 There's also a palatable will-they-won't-they relationship between McGregor and his neighbour Bea (Rose Byrne, who brings a lot of warmth to her role), an animal lover who seems oblivious to McGregor's growing hatred of the rabbits. It's by no means a disaster, with Corden a distinct presence as Peter, but those looking for a trip back to their childhoods will be sorely disappointed. General release from Fri 16 Mar.